Lorenzo Ghiberti, a Florentine goldsmith, designer and premier sculptor, was one of Early Renaissance’s significant Old Masters. Only his pupil, Donatello, superceded his skills in sculpture during the quattrocento period in his native Florence. Ghiberti was born in 1378. He was trained as a sculptor and goldsmith and established a prominent workshop for metal sculpture in Florence. He also wrote a very important book, the Commentarii, which not only contained lessons in art but was also considered as the earliest surviving autobiography of an artist. 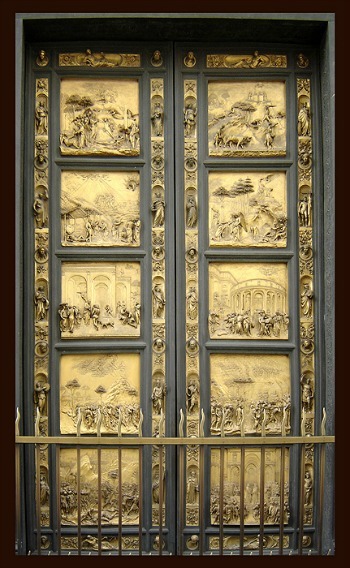 Although he had several commissions, two of the most important and widely known are the two sets of sculptural reliefs for the doors of the Florence Baptistery, which he spent working on for most of his life. The first set was done between 1403 and 1424. The second set was the one dubbed by Michelangelo as the “Gates of Paradise,” a commission that he did from 1425 to 1452. In early Florentine Renaissance, there was no question that Ghiberti was a very influential contributor and his work was very deeply honored by the public and fellow artists. Lorenzo Ghiberti professionally debuted in 1400 when he went to Pesaro to create murals commissioned by Pandolfo Malatesta. By that time he had received training in goldsmithing in the workshop-studio of Bartoluccio (Bartoli di Michele). A year later he was back in Florence. He learned that Arte di Calimala was having a competition for a new bronze Baptistery door as a matching pair to the one done by Andrea Pisano. The subject was the Sacrifice of Isaac, and the competition required that a sample should be cast in relief. Among the seven finalists were Jacopo della Quercia and Filippo Brunelleschi. In the end it came down to just the youngest finalist, Ghiberti and Brunelleschi and the former won. Despite his age (23), his entry piece showed his maturity and advanced technical knowledge. His style was a combination of Gothic and Classical influences, which persisted throughout his career. The contract for the Baptistery’s new door was signed eventually in 1403. It required the creation of 28 panels divided into 4 panels for each row, depicting scenes from the New Testament. As other commissions came in, it took Ghiberti over two decades to finish the door. During this period, his workshop was the most influential and largest in Florence. He had 11 assistants and took in several more including Benozzo Gozzoli, Michelozzo, Paolo Uccello and Donatello. While in the middle of doing the new door, Ghiberti also created jewelry, papal miters as well as stained glass for the cathedral in Florence. 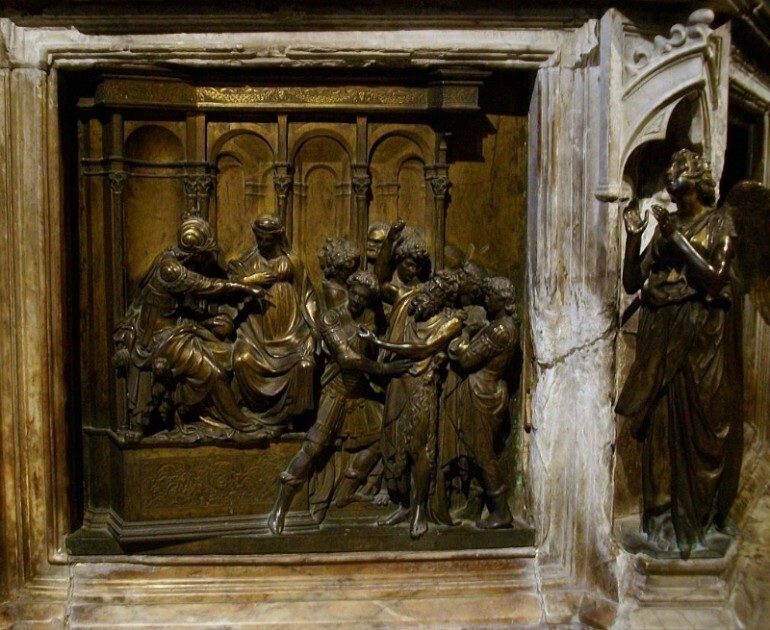 He also created bronze statues of St. Stephen, St. Matthew and John the Baptist for the Or San Michele church. His works showed that Ghiberti was unrivaled when it comes to large-scale bronze casting. When the first door had been installed, Ghiberti was again commissioned to create another door for the same church, with scenes from the Old Testament. This one, which is about 9 feet by 4 feet in size, has two wings with five square panels on each wing. Each wing is framed and decorated with 24 alternating statuettes in niches and heads of prophets in roundels. The top and bottom of each wing are decorated by reclining figures. When it was finished, Michelangelo called it The Gates of Paradise. In this masterpiece, Ghiberti showed both aerial and linear perspective, with gradation from shallow relief in the background and high relief in the foreground to show a visual difference in sizes. It took 10 years (1428-1437) to cast the 10 panels of the new door but work on the frames and the chasing continued well into the 1440s. The final gilding was done in 1452, the same year that it was installed at the Baptistery’s east entrance. Ghiberti was lucky to have seen his finest work installed where it was intended to be, for he died three years later. While many compare Ghiberti to his pupil, Donatello, it cannot be denied that he developed systems and solved many pictorial problems during the Renaissance, such as linear perspective.